In this post we will discuss how to enable self-service site creation for the web application in SharePoint 2013. Self-service site creation enables the automatic creation of a separate site collection for users when they first view their My Site. - To enable self-service site creation for a web application, the user must be a member of the Farm Administrators group on the computer running the SharePoint Central Administration. - First Open your SharePoint 2013 Central Administration, then go to Application Management section, click Manage Web applications. - Then in the Web Applications page, select the web application that you created to host My Sites. - On the Web Applications tab, in the Security group, click Self-Service Site Creation. 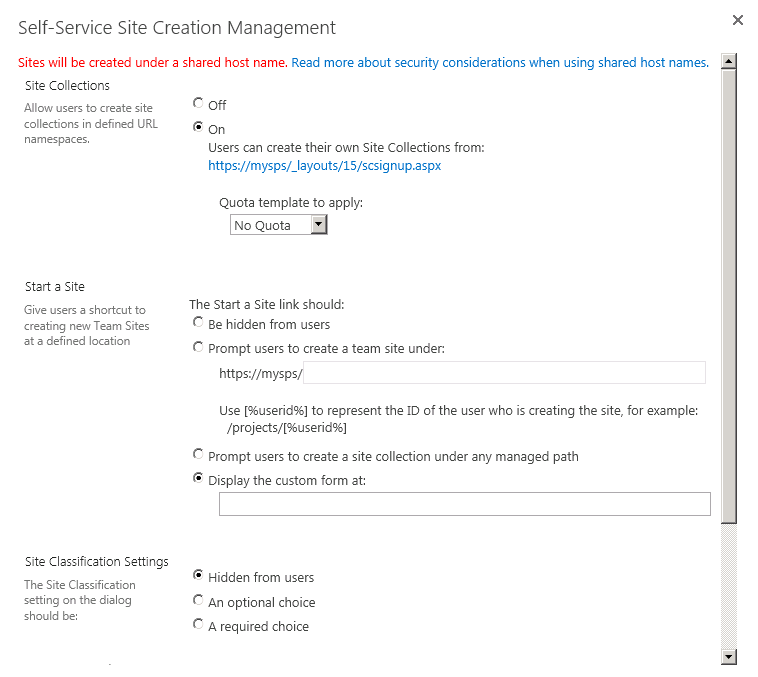 - In the Self-Service Site Creation Management dialog box, in Site Collections, select On. Optionally, in Quota template to apply, select a quota template. 1. Prompt users to create a team site under so users can create team sites from their My Site to use site feeds. 2. Be hidden from users if you do not want users to create team sites from their My Sites to use site feeds. - Click OK to finish.